Earwigoagin: Seen at the 2016 Sailboat Show: The X-Cat "Multi-Sport"
Seen at the 2016 Sailboat Show: The X-Cat "Multi-Sport"
Another engineering design marvel at the show was the X-cat. The X-Cat is an Austrian import; a rowing, sailing catamaran that is designed to be easily broken down for transport or storage. Marketed as a "multi-sport" catamaran, one can buy four models: the base model which is just the catamaran (presumably with this model you would desire to add some low horse-power motor to get around with), a sailing model, a sliding seat rowing model with a conventional rear-facing seat and oar set-up, and a front-facing rowing model. 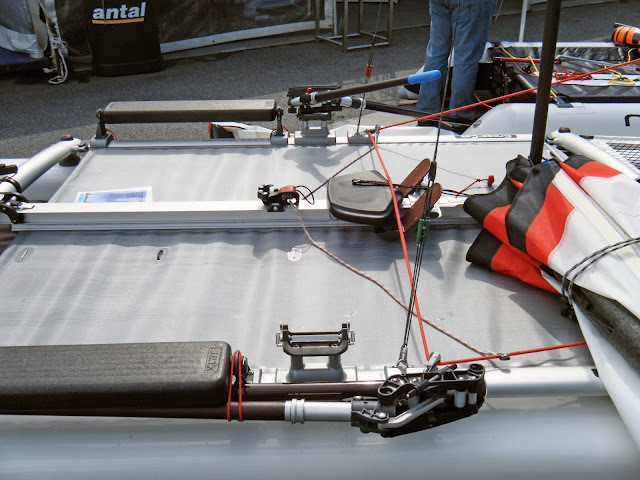 The X-cat at the show was out-fitted with both the sailing rig and the front-facing rowing kit. 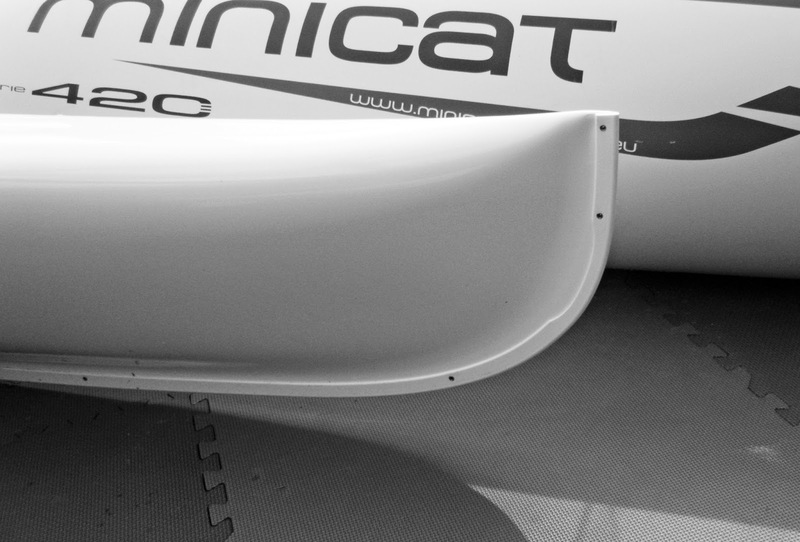 One of the X-cat hulls. Interesting to note was this riveted center seam which indicates the hulls are molded in 2 pieces and then assembled together. This makes sense as the brochure touts the hulls being entirely foam-filled (it doesn't appear to be the blown in type but rather custom molded foam pieces to match the hull shape). Also, according to the brochure, none of the base hull pieces weigh more than 17.5 kg, so the X-cat can be easily loaded onto roof-racks when broken down. The front-facing bent oar system. The X-cat goes together with lots of custom push button fittings (no tools required). Obviously I couldn't witness an assembly of the hull - the brochure touts a time of 2 minutes, which seems a bit ambitious. The X-cat is approaching the market that has been carved out by the brilliant Hobie kayak/trimarans, but from a fitness machine, higher performance angle than the Hobies which have found a large market in the fishing, kick-back, day-sailing crowd. From my quick look over of the X-cat at the Annapolis Sailboat Show, the X-cat is indeed a very high-quality product. The brochure mentions there will be some new E-power options in 2017. I tend to agree. Choose the boat that is designed for that purpose. However, there is no arguing that these multi-purpose craft have been strong sellers in the marketplace. I would have never predicted that the kayak would have been a popular fishing vehicle, or that adding amas to a kayak would make it a a popular daysailor. Small Boat Sailing: Whither the Millennials?